This review is full of spoilers, just a warning for those averse, or those who actually want to see this movie...which I advise against. In an attempt to get a balanced look at the year, I brave a number of terrible films. While I try to limit my intake, just for my own sanity, I still found myself absorbing a number of turkeys like the ambitious but often laughable A Cure For Wellness, the try-hard and never funny The Lego Batman Movie, and up to this point the year's biggest flop, Universal's dead-on-arrival The Mummy. But to be frank, none of these films enraged me, none of them made me so perturbed that I spent two hours watching them, none of them made me question the actual intentions of their respective creative brain-trust as much as Alexander Payne's latest, Downsizing. Now, I'll say this, I typically like Payne's work to some degree - there's a touching element of humanity present even in his most outlandish concepts. I still firmly hold that The Descendants was one the least appreciated efforts of the not-very-good 2011 Oscar season, and I think it's still criminally under-discussed today, especially as one of George Clooney's finest performances. But even with a very consistently steady hand behind the camera, sometimes things can just go wrong. And lord, let me tell you, Downsizing doesn't get a damn thing right. Actually, that's not true. It has a pretty decent idea that acts as its germination. The oft-told cinematic struggle of the world simply not being to support its continually booming population has been a go-to stratagem for satirical and politically minded film-making stretching back to Soylent Green, and that old chestnut rears its head here. In an attempt to stave off that quagmire, a group of Norwegian scientists craft up a way for humanity to shrink itself and create newer, smaller communities within secure facilities across the world. Basically the idea is, if you're smaller, you'll utilize less resources (food, clothing, utilities etc...), even down to luxury items. This is a standard of living where anyone can afford a mansion, and diamond rings cost a pittance. This is what blue collar slaughter house foreman Paul Safranik (Matt Damon) steps into after he and his wife Audrey (Kristen Wiig) agree to "get small" once they get a chance to see a pair of old friends who have already done the same. Figuring this might be their chance to get ahead, they attempt to go through with the procedure. The catch is, in the middle of the process, Audrey backs out after Paul has already been minimized. And so Paul must start all over again: dating, a new career, new friends and neighbors, and try to find a new purpose. It turns out Paul's calling in life is to be the grossest example of white saviordom I've seen in a film in some time. You see, there's three pressing issues here with Downsizing. The first, Paul is an unbelievably boring character with no real personality traits to speak of. He's basically a blank slate for the plot to happen to. Yes, he has a former career path that he turned away from and an interest or two; he seems to like to cook, for example, but other than that, as a viewer you learn nothing about this guy. There's a moment where he complains to his upstairs neighbor, Dusan (Christoph Waltz), about the noise emanating from the parties he's throwing. Dusan scolds him for shouting like a crazy person in a previous encounter, but there's nothing inherent in Paul's character that would indicate he'd ever act like that. Some of this is due to Matt Damon, never the most exciting actor, being a bit miscast. Here the blandness that's always been an underlying facet of his performances comes to the fore - and you spend the entire film wondering why we couldn't have followed Wiig's character instead. The second glaring problem with Payne's latest is through the introduction of the film's key supporting character Ngoc Lan Tran (Hong Chau), a former revolutionary who now works as a cleaning woman after being snuck into the same facility that Paul resides in. 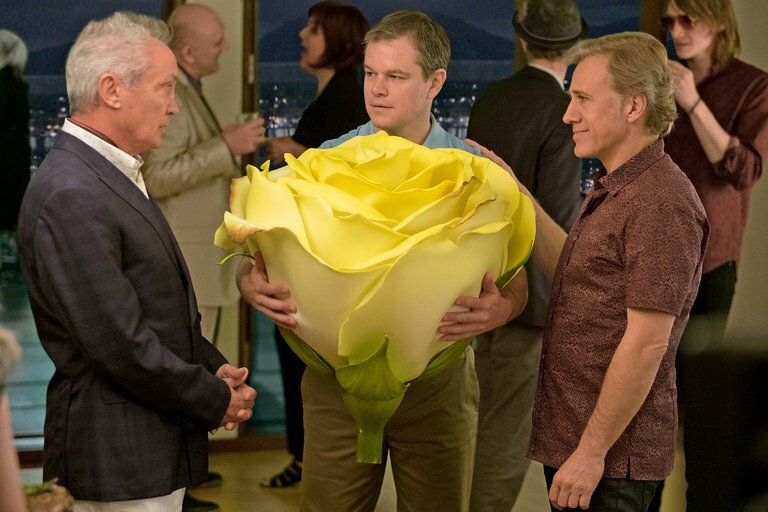 This is where Downsizing goes from being an aimless film about a sad-sack divorcee learning how to cut loose, to a movie about how a white guy can find his true calling in helping otherwise helpless immigrants living on the outskirts of society. It's so patently blatant that once you realize Payne is heading this direction, you just want to scream "No man, stop!". And if that isn't bad enough, Chau's character as written and as performed is, as the kids like to say, pretty problematic. There's a thin line between authenticity and caricature that takes a skilled writer and then an actor to be able to thread. I have no doubt that Chau, Thai-borne of Vietnamese immigrants, is doing what she can with the unfortunate material given here. The problem is that when her accent is paired with writing that portrays her as someone that doesn't understand the difference between a medical doctor and a physical therapist, or leaden lines when she questions Paul about the "8 different kinds of fucks", she ends up on the wrong side of the authenticity/parody divide. That the film often treats her as an object of derision, despite the fact that she's the only character with any real definition at all, speaks to how completely misguided everything about Downsizing is. Which returns us to the third issue, it moves like absolute molasses. By the time it moves into it's final third, with Paul, Ngoc and Dusan all faffing about with a group of cultists at the original downsized colony I just wanted the torture to end. By that point, Payne has given up on any pretense of trying to say something (whereas the first two-thirds are spent with him jumping from theme to theme, such as income inequality from the viewpoint of middle America, class conflict, overpopulation, racial divide) and instead decides to tie a bow on the whole thing by calling it a love story, which has the most unintentionally funny ending of all time. Payne clearly wants you to think Paul makes a key decision regarding his future, the choice of staying with Ngoc or going with the cultists underground, because he wants to stay with his newfound paramour. But the way it's paced and framed, it looks like the biggest factor in making up his mind was the length of the walk. All that to say, this is a film that cannot even get its pivotal emotional beat right, just imagine how badly it bungles everything else. I really hate this movie, so much. Instead of seeing it this weekend, how about you take in something else while you're spending time with the family over the holidays? Perhaps you'd enjoy Netflix's fine series The Crown? Or maybe the more cinematically adventurous of you could check out the excellent Call Me By Your Name? Dunkirk came out on Blu-ray this week too, you can't go wrong with that. Basically, life is too short. Watch good stuff. This might be the lowest point of a really bad year for Matt Damon, and that year includes The Great Wall.